The Chadian military has rescued 43 children from the Nigerian town of Damasak who had been abducted and prepared to serve as child soldiers for the jihadist Boko Haram terror group. The Nigerian military is currently embroiled in a struggle in the Sambisa forest, the last known stronghold of the terror group in the nation. The military found the 43 children hiding in the town of Damasak in northern Nigeria. Authorities say the children, ages 12 and older, had been abducted from areas throughout Chad, and they would work to reunite them with their families. 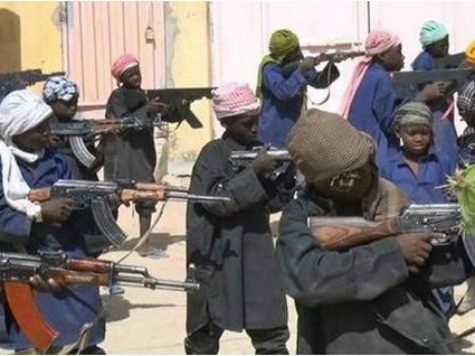 Col. Azem Agouna, spokesman for the Chadian army, confirmed that the children were Chadian citizens who had been taken to Damasak when Boko Haram captured that town, and that they were in the training process to become child soldiers. Soldiers found the children weeks after clashes between Boko Haram and the military began in the town; when the children felt sufficiently positive that Damasak was no longer in the hands of Boko Haram, they began coming out of hiding locations all over the town. Nigerian forces first claimed in March that they had fully liberated Damasak and reported findings of mass graves, including one under a bridge that housed at least 100 bodies. Three days after claims it had secured the town, and despite protests from locals that more security was necessary, Boko Haram returned, kidnapping between 350-500 residents. The back and forth appears to have led the children to hide for more than a month until they were certain troops had secured the area. It is notable that Chadian troops, not Nigerian soldiers, delivered the final blow to the terror group. The Nigerian government continues to struggle to contain the terrorist group. Officials announced this week that Nigerian soldiers penetrated the outskirts of the Sambisa forest, the last known Boko Haram stronghold in Nigeria, with the aid of fighter jets. “The operations especially in forest locations are progressing in defiance of obstacles and land mines emplaced by the terrorists,” said a Nigerian military spokesman on Wednesday. By Thursday, Reuters began to report that the Nigerian army was retreating from the forest out of fear that “the area was booby-trapped after three pro-government vigilantes were killed by a landmine.” Reuters cites a Nigerian government source and a vigilante fighting Boko Haram in the area. “The soldiers have retreated to Bama because of mines. They had been on the road but that made them vulnerable, so they moved to the bush but there are mines planted there (too),” said the soldier. National news outlets report precisely the opposite–that it is Boko Haram jihadists who are running out of ammunition and running away. Vanguard reports that Director of Defence Information Major General Chris Olukolade told the outlet that Boko Haram is severely lacking firearms, which is weakening the group’s effectiveness: “you can find more than 500 members of the insurgents with only few of them having rifles and even when one or two of them have rifles, it is like a stick, as they have run out of ammunitions, because the usual supplies they get are not forthcoming.” The group, he claims, is mostly armed with machetes and more rudimentary weapons.